There have always been badasses around, and the Stoic philosophers have a reputation as being some of the original ones (think Russell Crowe in Gladiator). As part of the research for my next book project, I have been reading Seneca’s Letters From a Stoic for the first time. 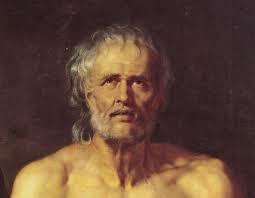 Seneca was a Roman philosopher and statesman, roughly a contemporary of Christ, and a tutor and advisor to the emperor Nero, at whose hands Seneca was ultimately killed. The life of folly is empty of gratitude, full of anxiety: it is focused wholly on the future. What sort of life do you think is meant by ‘life of folly’? … [H]e means our own life, precipitated by blind desire into activities that are likely to bring us harm and will certainly never bring us satisfaction — if they could ever satisfy us they would have done so by now — never thinking how pleasant it is to ask for nothing, how splendid it is to be complete and independent of fortune. So continually remind yourself, Lucilius, of the many things you have achieved. When you look at all the people out in front of you, think of all the ones behind you. If you want to feel appreciative where the gods and your life are concerned, just think how many people you’ve outdone. Seneca’s words ring as true now as ever. In this age of media deluge, it can be difficult to see the forest for the trees, that — abundant though media is — everything that we are exposed to via a two dimensional screen is a construct, something deliberately made for the sake of a certain end. Some of these ends are good, and some are pernicious, but the world is larger than the media. Just as Einstein suggests that the proper perspective from which to view the physical world is a ‘local’ one, so Seneca argues that the proper perspective from which we should view life as a whole is our own lives. Our own lives have to be the starting-point and the reference point for judgement, not the lives that we see on a screen. After all, we know our lives, we don’t know those of others. Why be concerned about others, … when you’ve outdone your own self? Set yourself a limit which you couldn’t even exceed if you wanted to, and say good-bye at last to those deceptive prizes more pernicious to those who hope for them than those who have won them. If you shape your life according to nature, you will never be poor; if according to people’s opinions, you will never be rich. As an american citizen living in this age of consumerism, we are defined by the objects we possess and motivated by the ones that we wish to acquire. From the time we are born we are taught to live by this doctrine. Now, while taking an introspective look into one’s life to discover an intrinsic value for one’s individual worth would be beneficial to society as a whole, the men who reside behind the curtains pulling the strings would stand to lose everything. For this reason, it is unlikely that we will see a revolution in this train of thought, at least not one originating from contemporary media outlets, as they have nothing to gain by it. Great article. A good philosophy for not only millenials, but also pre-millenials (some folks have a harder time adjusting to the ever-changing technology since the last ten years). Good article, Josh.